Yesterday was a pretty hardworking Sunday already, and the projects developed nicely. By the end of this third day, a tower was up, a hole dug and one of the buildings started to look something like a house. The tick panic made a headline in the breakfast table, as it turned out that one of those “nasty bugs” had actually been found in real. They do exist, be aware. The most impressive object on the field so far is no doubt is the Error-tower which seems to project energy already by looking at it. The wooden structure is beautiful in its technicalities which make it sound and steady (steadiness tested by villagers later in the evening - no defect on the object was detected). The kiln stove building has taken a good opening as well, Juha and Noora made the foundation hole already in the morning, all the materials seem to be gathered together, they now only have to figure out what the exact shape will be. 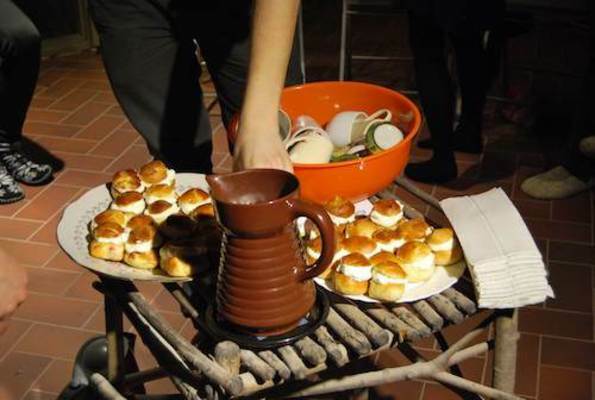 And last night we all got to press our fingers in a greenish wet clay while making some dishes to be burnt in the stove and used in the vege restaurant. We also got some help from Mooste kids who kindly shared with us their experience in the matter. The camera obscura is all covered with cardboard and is now the most house-like construction. Still, as the builders said, their aim is not in the looks of the box itself, rather, the beauty, and the secret of it, lies inside. A sneak peek under the cover confirms: the insides of the box do look pretty already. John put up the first of four poles with windharps, which, left alone on the Site for the night, made a quiet singing sound. Another way of using wind power. In fact, some new ideas are hatching already. While making our clay plates, we were witnessing a preparation of costumes for a Parasite Opera, the rehearsals of which are supposedly starting later today. The change in the nature of efforts from intellectual to physical kind also showed in the evening when everybody suddenly disappeared by about 10 p.m. off to bed. And by the next morning, the enthusiasm got someone up and sawing no later than quarter to eight... It looks like another beautiful sunny-summery-building-day. Have fun! MoKS resident artist Masayo and me we were just cleaning the chanterelles when... there they were ... arrived. During a few hours, the cores of all the groups. Bits of Error Collective after Playground Italians, Maboro Maiko (to accompany Masayo) after some more Error Collective. And then the CamObs Danny along with the crew – Patrick after Mari, Tuuli after Patrick and vice versa, as some of them disappeared to some more chanterelle picking in the mean time. So many arrivals! First everyone was guided to their rooms, and after they got to know their space and settled in, more and more people found their way to the dining hall. 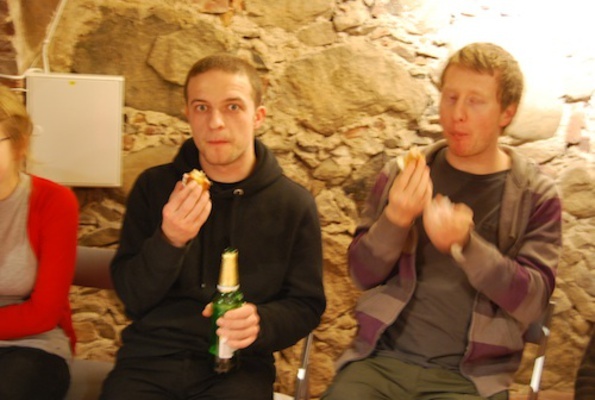 After long hours waiting patiently, finally at half past 9 the dinner was served by the crew – delicious chanterelle quiche. And one without mushrooms, and one meal without eggs and butter as well. After the dinner we had a greeting and introduction speech about this years' symposium and its basic idea from John as well as the circle of „getting to know each other”. It appeared quickly that we have artists and non-artists gathered to participate this year (again?) – for example the designers and architects refused to call themselves as “artist“. We also have our own local biologist to help us out to differentiate a tick from a little spider, and in the mean time write his own blog (in Estonian). For food we were enjoying the donations from Mari K. and her mother from Mooste garden, and a really popular red currant drink made out of juice from Tiiu working in Villakoda. The sleeping time seemed to start quite early for everybody. I guess for waking up next morning to the smells of Mari's porridge and Siiri's coffee. For this breakfast we had to be grateful for other supporters – some oat flakes for porridge and super special apple-zuccini-lemon jam from Liilia, and wonderful black currant jam from Mari's granny. 10.30, according to John's schedule, the Mooste tour started. If usually the guided tours here are all about the manor and the old times – when things were built, for what purpose, and what are they used for nowadays –, then on our walk the culturally interesting objects included: trash wood sticks pile next to old piggery, all-kind-of-trash on many other spots around the manor, The Site (becoming Moksville), allotment gardens, directions to The Café (our lunch place for most of the days), and trash wood sticks pile next to the kindergarden. While back to MoKS, one could see really serious working mood all over the house – I spotted Noora and Juha first seriously discussing and drawing in the eating hall and then very soon in the basement trying out smth mystical with strings, Justin setting up electronic workshop on the other side of the basement. Italians remained more hidden – only after the nice lunch at Mooste Kohvik I spotted two of them also drawing or writing smth at the eating hall. And even more hidden remained the sweet Japanese girls. Probably they are developing the concept and prework, and also waiting for their volunteers – Tartu art school students – to arrive on Monday to help them out. On the first full-day, naturally, not much else is there to be seen yet but the huge sparkle of excitement in everybody's eyes, and some serious thinking can be concluded, as the questions have started to merge and sound – about the additional supplies everybody have spotted still laying seemingly deserted, without an owner, all around the old agricultural / collective farm surrounding. 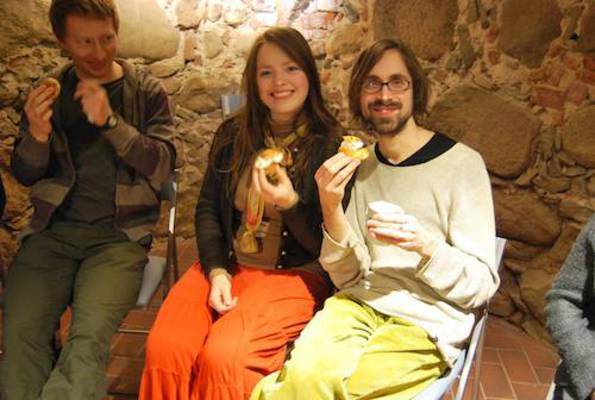 The Error collective (Ernest Truly, Justin Tyler Tate, Päivi Raivio, Mikko Laajola) is experimenting the local energy ressources by constructing a windmill which would generate energy for the village. Naturally, there's some room left for Error to happen. 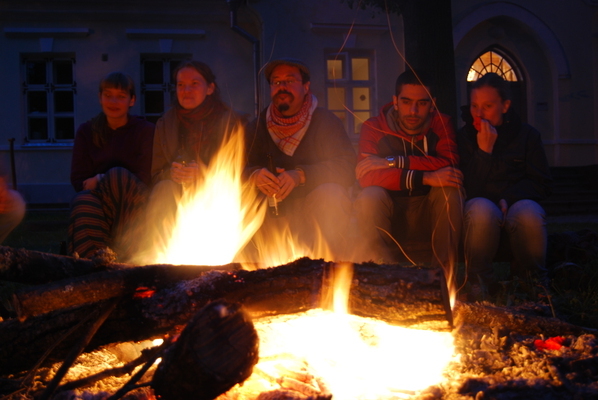 First drawings have been made, first pieces measured, and first bonfires lit. And what could be better for creating ideas than a good Saturday night sauna. Some groups like to start off with a good theoretical basis with thorough calculations, others concentrate on inventing in practice and go along as the work develops. But all are open for inspiration to come along the way and exchange of ideas. Dear friends! This entry is in Estonian. 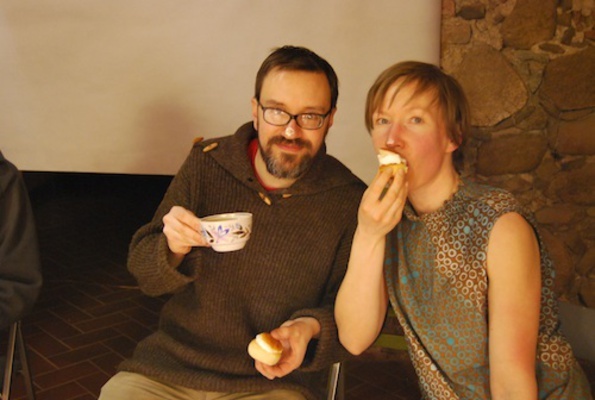 Please visit Felicty Ford's blog to read more about this event and her residency in Estonia! 26. mail toimus MoKSis järjekordne Leidnikerdajate klubi kokkusaamine. Seekord vedas seda Felicity Ford Inglismaalt. Felicity on helikunstnik, kelle suureks kireks on kõik, mis puudutab villa. Tuginedes juhtmõttele, et peaksime teadma, kust meie rõivad tulevad ja mis infot endas kannavad, huvitavad kunstnikku kõik astmed lammaste kasvukohast kuni valmis kudumite ja nende kandjateni. MoKSi tuligi Felicity suurelt jaolt selleks, et tutvuda Eesti kohalike lammaste ja siinse villaeluga laiemalt, ning helisalvestada ja dokumenteerida oma residentuuri. Nõnda siis saigi, et pärast lammaste kaardistamist Kesk-, Lõuna- ja Edela-Eestis (Kihnus-Ruhnus ka!) tuli Felicity tagasi ja tegi kõigile huvilistele töötoa, kus värvisime lõngu looduslike värviandjatega – Eesti kaselehtede ja Inglise sinerõikapallidega. Ka lõngad, mida värvisime, olid pärit kummaltki maalt, sealjuures Inglise lõngad olid lahkelt toetajalt Blacker Yarnsilt – nende naturaalne värvigamma varieerus valgest päris tumedani, mis andis meile, nagu Felicity ise oma blogipostituses ütleb, sinise vikerkaare. Peale lõngavärvimise, mille kirjelduse leiate pärast galeriid, toimus veel aktiivne tutvumine üksteise villade, lõngade, lammaste ja tegevusega, vahetati lõngu, villa, kogemusi. Ja Ülle Prost siitsamast Moostest tõi näha oma üliväärtusliku taimedega värvitud lõngade näidiskausta! Vaata pildigaleriid kogu ettevõtmisest – kohtumisest, tutvumisest, värvimisest ja veel ühest olulisest päeva osast – villavahetusest! Värvimisprotsess ise oli kummagi värvi puhul erinev. Tuuli, Kata ja Felicity korjasid eelneval õhtul kaselehti, rebisid neid katki ja panid likku. Enne värvima hakkamist kuumutasime need 80 kraadini ja kurnasime vee lehtedest. Seejärel panime lõngavihud tunnikeseks sellesse värvivette (lehtede ja lõnga koguse suhe kaalu järgi võiks olla 2:1). Lõngad olid eelnevalt peitsitud ilusa, selge kollase tooni saamiseks 4% viinakivi ja 14% alumiiniumsulfaadiga. Need ained tuleks peitsima hakkamisel korralikult ära lahustada ja keema lasta. Siis võib lisada eelmisel õhtul likku pandud lõnga/villa, lasta segu keema ja võtta seejärel tulelt ära. Siis ongi kiud peitsitud ja valmis värvilahusesse panekuks. Tulemuseks saime säravkollased lõngad (värv tuleb tunduvalt pruunikam, kui kaselehti kõvasti keeta, st temperatuur värvivee tegemise ajal pikaks ajaks üle 80 kraadi lasta). Sinerõikaga värvimiseks lõnga eelnevalt ei peitsita, küll aga leotatakse, vähemalt tund, aga veel parem üle öö. Sinerõikapall tuleb kergelt lahti murda ja sellele veidi vett peale panna, et see pehmemaks muutuks. Seejärel tuleb katta pall umbes 2 l keeva veega ja jätta umbes pooleks tunniks vette. Seejärel vesi kurnata ja sinerõikatükid korraks ettevaatlikult kõrvale panna. Lahusele tuleb lisada 40 g pesusoodakristalle, et see leeliseliseks muuta. Seejärel tuleb vedelik korralikult läbi segada, et ained selles lahustuksid. Lahust võiks umbes 15 min jooksul valada mitu korda edasi-tagasi ühest ämbrist teise või vispeldada, et vedelik seguneks ohtra hapnikuga. Seejärel tulebki sinerõikalehed tagasi lahusesse panna, ja natuke võib veel edasi vispeldada. Hapnik vabastab sinerõikalehtedes oleva sinise värvipigmendi – indoksüüli. Kui vedelik on korra korralikult õhuga segunenud, peab lisama 25 g naatriumvesiniksulfiidi, et nüüd kogu see hapnik jälle värvilahusest eemaldada (siis kinnituvad vabastatud sinise värvi pigmendid täielikult lõngale). Seejärel võibki lõnga ettevaatlikult lahusesse asetada. Nüüd ei tohiks seda enam segada ning värvimisnõul tuleks hoida kaas peal. Soojenda sinerõikalahust püsival kuumusel 50-60 kraadini ja jäta vill umbes tunniks ajaks lahusesse. Kui vill seejärel välja võtta, näeb kõige põnevamat osa kogu värvimisprotsessist – esialgu määrdunud kollakas-roheline lõng muutub kohe õhu kätte jõudes ilusaks siniseks. Seejärel võiks kõigepealt lõnga kuivama riputada, ja pärast seda pesta piisavas koguses soojas, kergelt villapesuvahendises vees. NB! Villa pesemisel võib vee temperatuuri varieerida külmast soojani, ent mitte kunagi ei tohiks panna tulist lõnga jääkülma vette, v.a juhul, kui eesmärgiks on villa vanutamine! Kõige õigem oleks püüda hoida kogu villa pesemiseks kasutatav vesi enam-vähem ühe ja sama temperatuuriga. Töötoas värvitud sinised toonid tulid plassimad, hallimad, kui varem tehtud proovivärvimisel. Ilmselt võis seda põhjustada see, et naatriumvesiniksulfiid sai lisatud ühe korraga, ja enne seda veel vähese veega segatuna; või siis seetõttu, et panime koguseliselt rohkem villa värvilahusesse. Täpset põhjust me kahjuks ei teagi. Vaadake kindlasti ka Felicity enda blogipostitusi töötoa ning kogu Eestis viibitud aja kohta (leiate sealt koguni 7 postitust, "Landing" võtab kokku kogu kuuajalise seikluse). MoKS ja Felicity Ford tänavad kõiki toredaid inimesi, kes töötuppa tulid ja oma väärtuslikke kogemusi, oskusi ja ilusaid emotsioone jagasid. Peale selle täname südamest oma toetajaid Briti Nõukogu, Eesti Kultuuriministeeriumi ja Kultuurkapitali, ning lõngaga varustanud Blacker Yarnsi. Leidnikerdajate klubi koguneb kord kuus. Selle eesmärk on kasutada ära vanu materjale või katsetada kohalikke ja/või looduslikke materjale; leiutada uusi n-ö kiiksuga esemeid ja kohandada mis tahes olemasolev materjal, esemed vajaduste järgi, kasutades selleks loovust ja ilumeelt. Jälgige ikka meie kodulehte, kus ilmub info järgmiste põnevate sündmuste kohta! From February 19th-24th, MoKS organised another GROUND workshop. 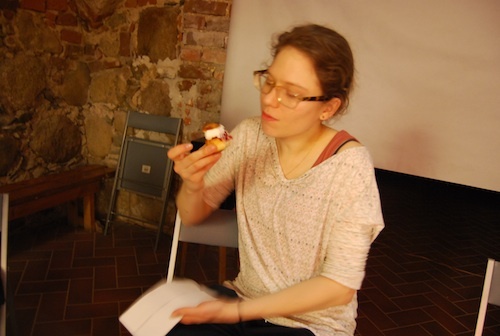 It was 2nd time in Mooste and 4th GROUND workshop in general (2 more to come in Poznan and Helsinki). 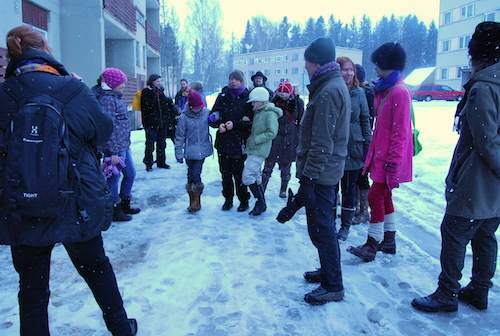 This workshop focused on fieldwork- 16 participants were given possibility to develop a work or research in public institutions of Põlva, Ahja and Tartu. 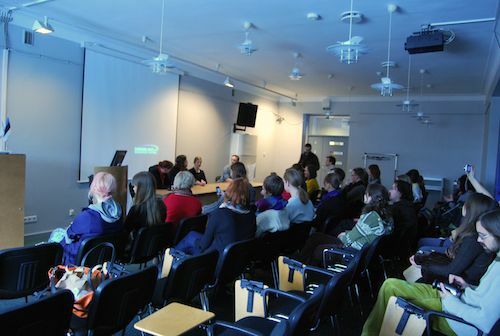 Our collaborators this time were Ahja elderly home, Ahja Youth Center, Estonian National Museum and Põlva Art School. 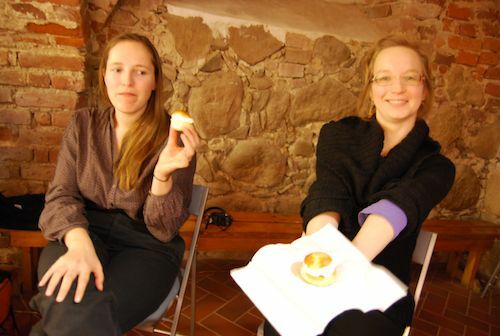 Though participants had to face several limitations, hardest of them were probably time, language barrier and novelty of a situation, there were strong connections and works developed. At 1st sight most difficult and depressing place. Elderly home is located on ground floor in one of the block houses in Ahja. 15 inhabitants between ages 59-93, all in very different physical and mental conditions. Epp, Lumi and Iina approached the inhabitants of elderly home with great sensitivity and openness, using different ways to get closer to the place and its people. Eg drawing and everyday chatting. 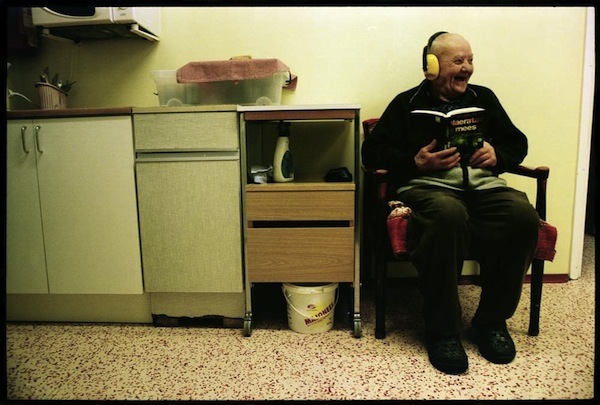 Their research is concluded in a tear bringing short-film Nooruse 2, where you get to know some inhabitants of elderly home. Men and women are portrayed while listening to their favourite music from their youth. Young and eager team of curators and organisers from Estonian National Museum offered for a GROUND group possibility to interact with their new exhibition. 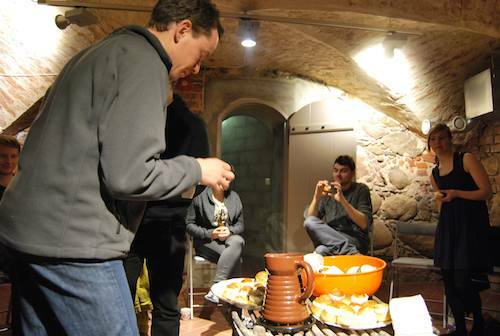 It was the show about consumption culture in Estonia in the turn of the century. As the exhibition was all ready, the GROUND group felt pressure of adding something meaningful for the show. 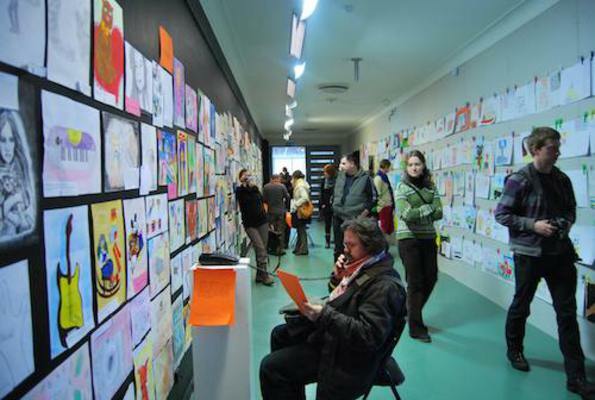 The exhibition is dominated over 3200 drawings by kids about their most liked and unliked presents. As the exhibition represents and analyses mostly views of active and potential consumers, the GROUND group felt that something is missing- namely the voice of people who are not anymore the targets of marketing. So they conducted a series of interviews with Tartu and Ahja elderly home inhabitants, asking about their youth-hood consumption habits. In the final presentation visitors entered the space, what had no kids, but sound, lot of different sounds, recorded during the week in the Youth Center. 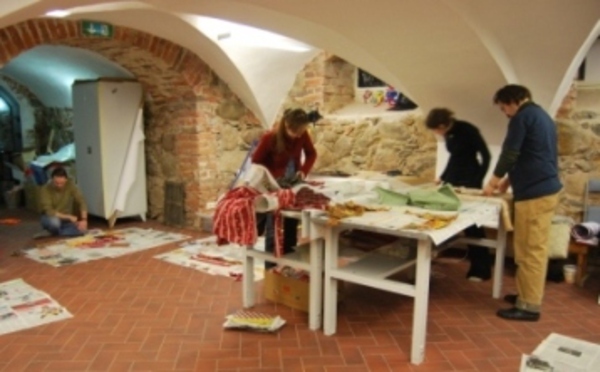 Põlva Art School is run by an energetic woman called Anne Prangel. As this was very busy week at school, she gently directed our GROUND group to explore the rest of the house where the school is located. The school is on the top floor of the castle-looking Põlva Culture Centre building. Built in 1980ies, the house was meant to be the main cultural centre for the Põlva county, hosting theatre plays, rock and classical music concerts, conferences and fairs. The current situation is different, Põlva cultural centre has definitely the biggest house, but it is one among many others in the area. That means high competition for resources and struggle for finances. Where one has to make a decision whether to put most of its finances into heating and lighting up the giant culture building or developing its programme. 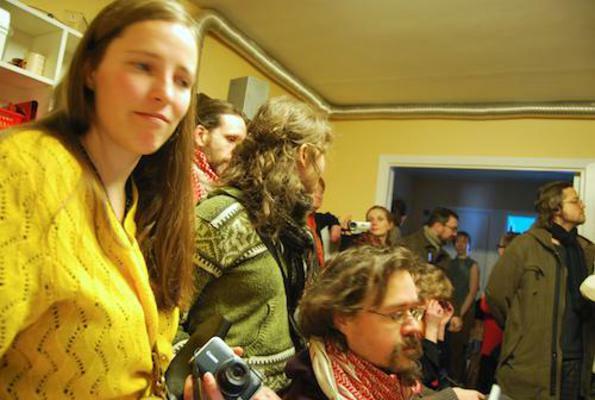 Kristiine, Adrianna and Hannes conducted a series of interviews inside the culture house and outside around town, asking people about their relationship with that building. 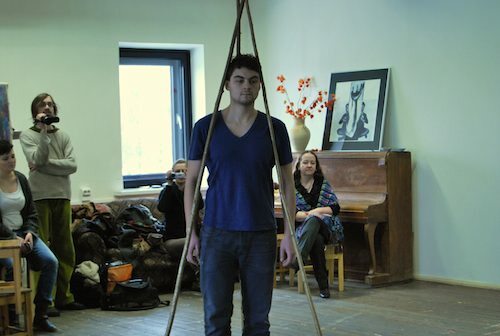 Sylwester developed a performance, where one could see a man inside a structure, walking with it around the room and trying to get out from the room. Yes the time was short for developing meaningful relationships and works, but both sides (hosts and artists) could take it as an exercise for creative everyday living and bringing sense into daily routines. 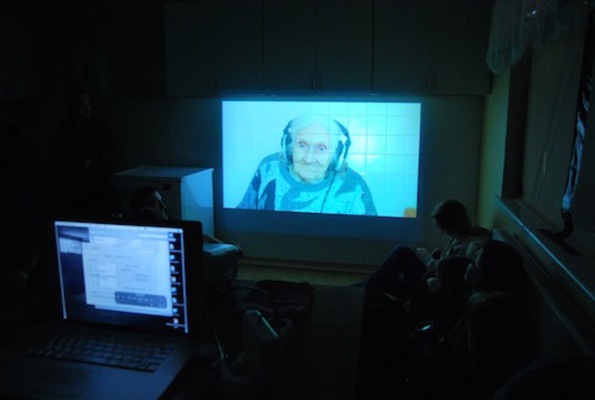 We would like to thank all participants and our collaborators from the locations, particularly Piret Palm from Ahja Youth Center, Milvi Groznõi from Ahja Elderly Home, Anne Prangel from Põlva Art School, Maire Pedras from Põlva Culture Center, Siim Angerpik, Jaanika Jaanits, Pille Runnel and Taavi Tatsi from Estonian National Museum. Supported by Grundtvig Lifelong learning programme. The general technique is rather simple: you need old fabric for your composition, plastic mesh (and old newspaper to put under it to protect your table/floor), the white wall(paper) glue ('seinaliim'), spatulas to spread the glue on the fabric. While we were rehearsing the basics, Tuuli herself experimented with a technique of cutting the fabric into tiny pieces, mixing it into a mass with glue, and spreading this over the mesh. This also seemed to have a really nice outcome. You are all welcome to join in next time and bring your ideas with you – which means also proposing your own subject and guiding other tinkerers! For example, at some of the next meetings we are probably going to experiment different techniques to tie-connect-glue cardboard with environmentally rather harmless materials (avoiding nails or staples, for instance) to make sculptures or – why not – some useful objects for the household. This will also serve the much bigger MoKS plan that you will hear more about soon – just to keep up the excitement! The next club is planned for the 1st of March, the doors open at 17:00 and the tinkering foes on until 20:00. The cost per club night is 3€.